Salad burnet can be used either fresh or dry as a tea, tincture or oil. Salad burnet also makes a great addition to any dish as a leafy green. Blanch the watercress, chervil, burnet and parsley in boiling water for 30 seconds. Drain and dry thoroughly, then pound in a mortar with garlic, shallot, and a pinch of salt. Then beat in the butter. This is a rich and comforting soup,with the Burnet puree adding a refreshing accent. Melt 2 tablespoons of the butter in a soup pot. Slowly saute the onion until golden. Add the chicken stock, mace and milk and potatoes. Raise the heat until the mixture simmers, cover and cook until the potatoes are soft. Add the garlic. Puree the soup until smooth. In another pan, saute the corn kernels in the remaining tablespoon of butter. Sprinkle with a pinch of salt. In a separate container combine the Salad Burnet and 1/3 cup of the pureed soup. Puree this mixture until blended but there are still some flecks of green visible. Add the corn to the pot of soup and heat through. Adjust salt and pepper, and add more milk if the soup is too thick. Ladle the soup into individual bowls, and using a spoon, decorate each portion with the pureed green mixture: swirls, hearts, lettering — whatever is fun. Garnish with sprigs of whole leaf Salad Burnet. 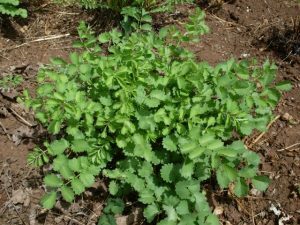 For more information on Salad Burnet look here. Cautions/Contraindications: Salad burnet is considered safe.